GAIL (India) Limited has issued notification for recruitment for Senior Engineers, Senior Officers, Foreman, Assistants in various departments. 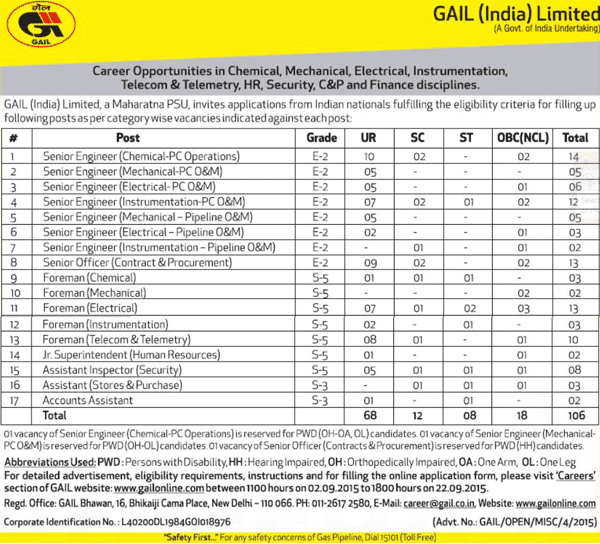 Interested candidates please logon to www.gailonline.com , which is the official website of GAIL. GAIL (India) Limited is the largest natural gas processing and distribution company in India under the Ministry of Petroleum & Natural Gas. Government of India granted Navratna status to GAIL in 1997. GAIL is a pioneer in City Gas Distribution (CGD) business in India. GAIL has been a leading public enterprise with a consistently excellent financial track record.